Photo above: Greenland, literally the land of green (photo Peter Gallinelli). Europe ... we rediscover a luxuriant flora and the moist sweetness of the atmosphere of the temperate regions; Our scientific samples have found their way to their respective laboratories and we are in the process of drawing the conclusions of the 'passive igloo'. With the distance, the life we conducted during a year seems to us more and more to come from a most audacious dream. It is doubtless an episode of our lives spent in one of the wildest inhabited places of our planet. But: where men live, life is possible. And for having lived it we can affirm that so it is. We have once again settled to our places in the turbulent world of civilization that runs, runs ... while the certainty of another world continues to vibrate in our hearts, where the caribou roams in compete liberty, the seal relaxes itself in the sun, man celebrates the present, here and now. Our admiration for the navigators of the past who ventured into these waters with the sole force of the wind and the arms is all the greater: we take full measure of the difficulty of navigating in a region where the maps are incomplete, safe anchorages are rare, fog is frequent and ice and wind conditions far from ideal for a sailboat. Still happy that our boat is comfortable and good sailing, even in slight winds, especially since we removed the useless propeller that has become an unnecessary burden. 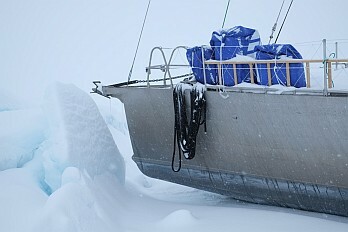 To thrust Nanuq's 20 tons in the absence of wind we still have the meagre power of the dinghy. However, slowness does not compromise our progress or our optimism, and brings us even closer to the elements. The encounters with the inhabitants are always as warm and the landscapes sumptuous, although the fog is particularly tenacious this year which can be explained by the exceptionally warm water temperature, at more than 10 ° C where it should approach zero degrees! 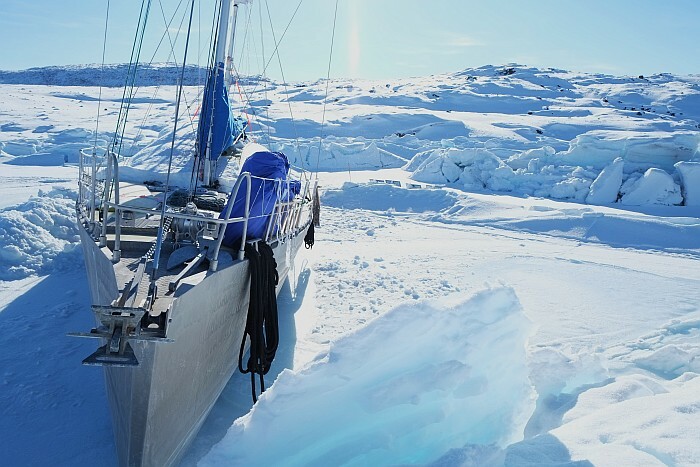 The ice melts very quickly and we encounter only a few bergs en route. Siorapaluq, Moriussaq, Kuvdlorssuaq, Upernavik, Umanaq, Qeqertarssuaq, Ilulissat, Aasiaat, Sisimiut ... known places pass by and the Arctic summer is coming to an end. The shadows lengthen and the first gales mark the turn. With the return of the night we are rewarded with beautiful auroras and rediscover the stars. Nanuq is now ready to spend her third winter in the north and ice. This time on her own. Already the tundra is coloured red, orange and bright yellow. The time to fly home to find our family has arrived. See you next year! Greenland. Land of ice, wilderness and profound beauty. Arctic summer with 24 hours of sun. Tranquillity and solitude. We have seas, mountains, lakes, rivers, icebergs and glaciers all to ourselves. I experience Icebergs for the first time, learning their sounds, artistry and dynamics. The thunder of breaking icebergs is never far away, the tinkle and fizzing of the bubbles in the melting ice is everywhere. When the icebergs break, they roll and turn and dance finding a new balance, creating new and wonderful patterns, shapes and lines, almost unbelievable in their finesse and exoticism. 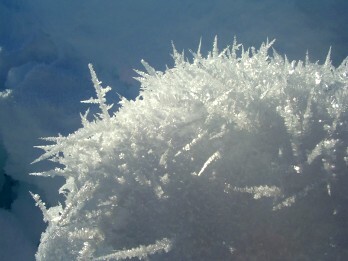 Or they crumble suddenly leaving a flow of floating ice debris. Alain, man of imagination and vision, sees animals, birds, dragons, fish, whales, boats, castles and more around us. They range from the huge to the tiny, dense to occasional. On the boat, anything bigger than a modest pumpkin is worthy of avoidance and would be enough to sink a normal sailing boat. 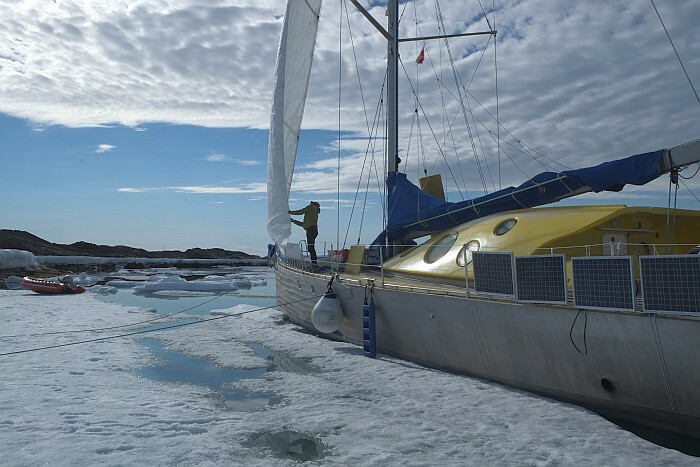 "Nanuq”'s custom built aluminium hull is strong - we hear the characteristic rasp of ice scraping along its sides as we sleep. To sail with the sunshine on a night watch is a new pleasure. As we move south and towards autumn, “night” changes from “the sun is in the north” and is now when the sun gives a gentle and curving caress to the horizon. Soon the sun will set, and we will have twilight, sunset and sunrise, the sun always moving across, much more than up and down. The change is fast, by the time we leave we have 5 hours of twilight. 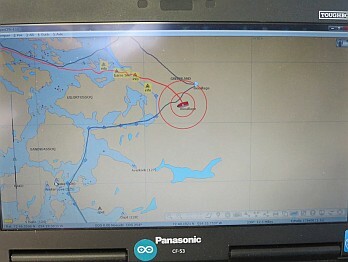 We sail south along the fiords. Every few days there is a small village or settlement nestled on the shore with brightly coloured wooden Scandinavian style houses and a small supermarket that must provide everything for the long winters here. Around the houses, are drying fish and seal-meat. 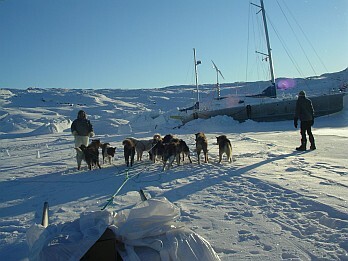 Husky sled-dogs sleep outside with young puppies running loose; the winter sledges are stacked high. There are no cars, nor roads. Transport is by boat; mostly very small open fishing boats, with hugely powerful outboard engines and enough space for 5 or 6 people at most. The locals are friendly, welcoming and curious. We are invited to Kaffemik, a party for the village (of 40) celebrating the first day of school for the son (now 6) of our host. We try caribou, halibut, muskox, arctic hare, whale fat and whale meat. Alain is invited to try a specialty: dip a piece of raw caribou fat in his coffee -- and swallow. Then it is their turn to inspect our boat, eat chocolate and take home trophies of our tea bags. Greenland has less wildlife on show than I imagined. The sea-birds are modest compared to UK shores. On land an occasional arctic hare, ptarmigan, and arctic fox (we never see Caribou). We regularly see seals, though always afloat. Then there are the occasional, treasured and humbling, sightings of whales. Huge fast-moving finbacks by the boat; feeding and diving Humpbacks by the ice. Across the bay, the tall unmissable spouts of whales on the move, and a different understanding of “Tha’ she blows!”. Greenland is a land of questions and contrasts. It is both ancient and new, empty and full, barren and abundant, bare and covered, harsh and delighting. The colours are subtle and muted and yet deeply vibrant. A small green plant on the dark rocks, seems more green than our garden back home. There are bright pockets of arctic flowers on the low tundra. Berries to be harvested. Crisp mosses and lichens on the rocks. Time appears to have a different scale. 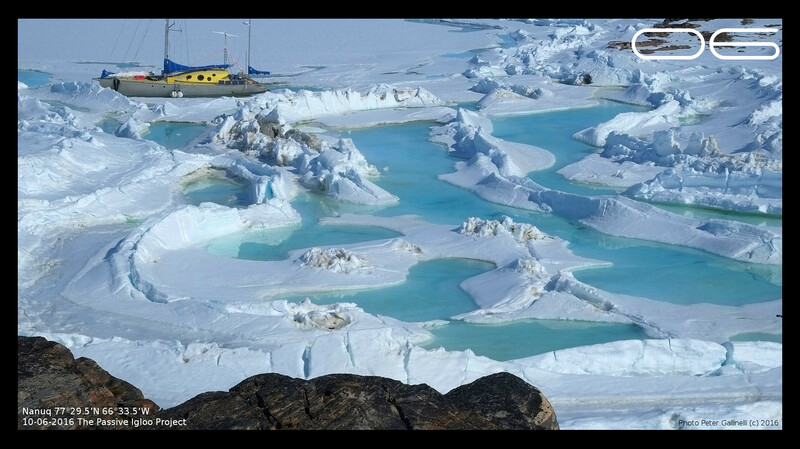 How old is the ice melting in the icebergs? 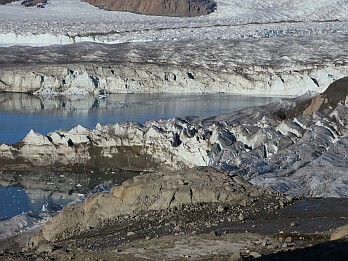 How long ago was this newly emerged glacial landscape carved out? 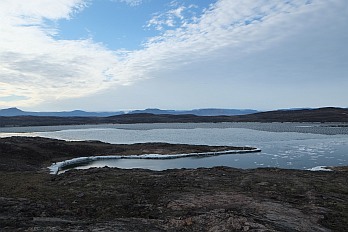 We sail across what once was a land of ice and is now a new fiord complete with islands. The ice is retreating faster than the maps can document. Old, new, fast, slow, beginning, end. Here it is easy to imagine the origins of our ancestors and modern worlds. Here there is no illusion of scale or importance. In such grand nature, we are tiny and in awe. 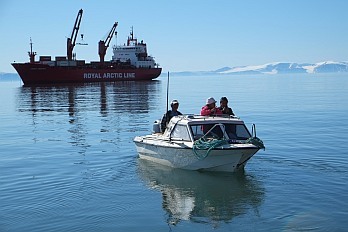 There we are, once again moored in front of busy Qaanaaq (New Thule). 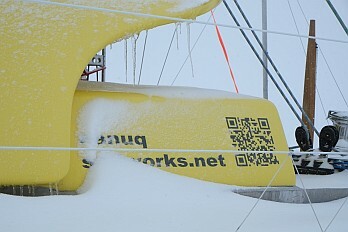 We are ready for the sailing season and awaiting our first crew. Heading South from now on: a strange feeling! Month of June. Our environment is changing and every day is different. Temperatures are around 0°C but they feel to us like summer. According to the locals, the season is 3 weeks earlier than usual. 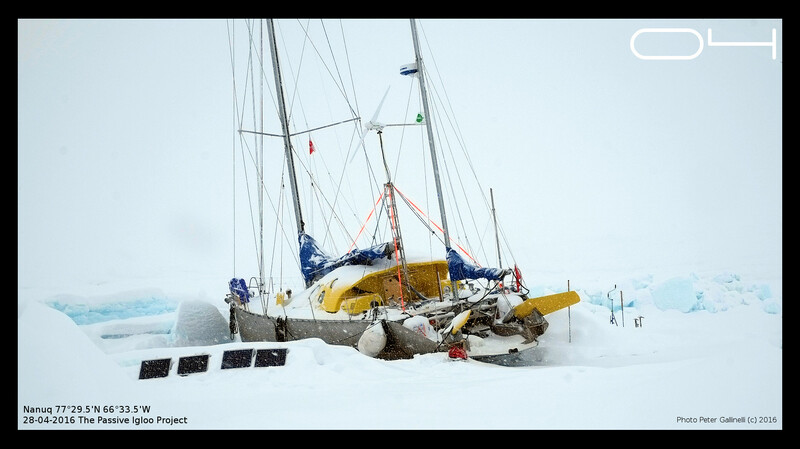 Our vessel slowly transforms from the 'illu' - the igloo, or house - to the 'umiaq', the boat that will allow us to sail home one day. Winter is over. We draw our first conclusion on the passive igloo project, a laboratory for self reliant and ecological buildings. And we can affirm that the initiative is a success. The passive igloo shows that it is possible to make buildings close to self sufficient as far as energy supply is concerned in simple and economical way, even in severe cold climates. Of course, there are details that can and should be improved - there always are (!). Especially, we were surprised by the lack or absence of Wind that was supposed to be our main power supply during the arctic winter. This was unexpected but demonstrated that a system requiring very little external supply to perform is also resilient: we were able to get along never the less. Not only strategies were tested, but each sub-system was tested in real conditions to its ultimate limit. During some periods, when we were completely cut of from civilisation, the conditions of extreme cold would not allow any failure. This means that the systems had to be very reliable. Being a completely passive system, the most reliable was the thermal insulation. As such, absolute efficiency proved more important than reliable supply. Last, but not least, the expedition had to cope with a limited budget. This fact made us stick to affordable solutions only. It is gratifying when an experiment confirms an idea. And it is very instructive when they diverge. Knowledge of reality emerges when ideas meet experience. 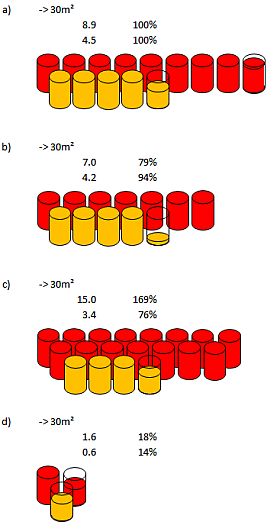 Comparison of fuel consumption of different housings in Northern Greenland for one winter : 1 barrel equals 200 litres of fuel, red for heating (excluding hot water), orange for electricity. Families are big and the houses are small. 2-3 occupants will occupy roughly 30m² of living surface. e) a house built to mandatory swiss standards (SIA), including mandatory living area, in Thule climate ... frightening! Design With Climate is a qualitative design assistant tool. 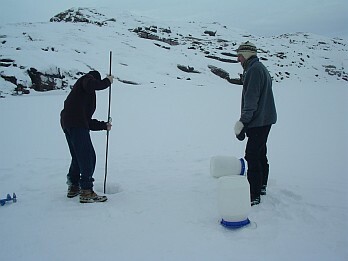 It evaluates winter and summer design strategies as a function of hourly climatic data of a given station at a clic. 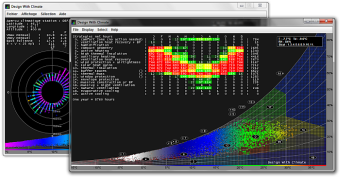 The psychrometric chart method is based on theoretical work by B.Givoni and M.Milne. Adaptation to cold and arctic climates and application development by P.Gallinelli. Enjoy! ... and this is a photo taken in May 2016 : amazing! Q (Frederic) : Is it crazy to make a project like this? If you have a dream, it would be crazy not to try to make it happen, even if it seems out of reach. Q: How did the idea of this project originate? Q: In such a project there must be obstacles? How did you overcome them? It wasn't easy to make this project happen. There were many obstacles, the most difficult being financing and time. It required determination, perseverance and patience. I made a lot of things myself and I had full support from my family and many friends who were essential to the success of the project. The support from our partners was also important. 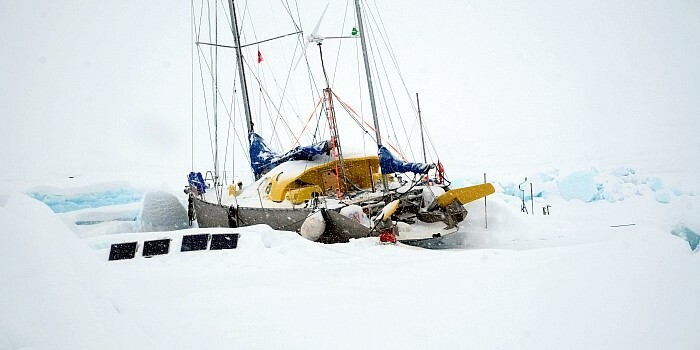 This assistance was needed to build the 'igloo', the boat and the project which took several years. It is important to be surrounded when the task is challenging. But these are also great opportunities to share. In a way it's like climbing a mountain: you must think of the next step only, and do it well. Q: If there was a message to share, what would it be? I like the quotation from Philippe Chatel saying 'Make you dreams devour your life to prevent life to devour your dreams'. It is important to listen to your dreams. Dreams are what make the world evolve. Some call it hope... It's not the easy way. But do we live to go the easy way? Interview with Frederic Gillet and Peter during a scientific camp in May 2016. The sun does no longer set. Day is continous. We have the impression to live on another planet. The arctic is so different, so special. Conditions are changing rapidly. Every day is different and warm air from the South brings the first positive temperatures since September last year ... and tons of fresh snow. 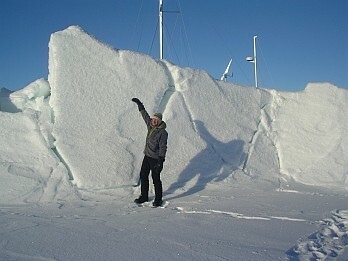 The snow cover lays heavily on the ice shelf and makes sea water rise above the ice. The walk to the village takes twice the usual time and is exhausting. Even our dogs are tired. The ice close to Qaanaaq has begun to break up. 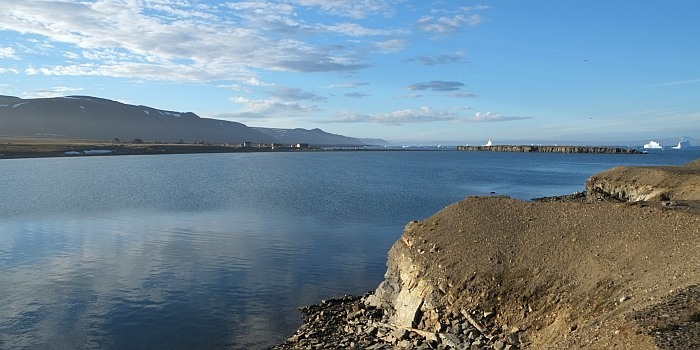 Siorapaluk has open water. The ice at 'Land's end' has disappeared. 2016 is on its way to become a record year for warm temperature. Progressively we prepare our vessel for the change to come. We have cleared the deck from the thick snow cover that has acted as a warm winter blanked, giving us additional protection from the harsh cold. Although temperatures are between -5°C and -15°C, the sun heats the exposed surfaces to above zero temperatures, especially aluminium wich is a good absorber. We have stowed away our winter clothes that have become too warm to wear. At noon we can roam outside just dressed in long johns and a T-shirt. We see the first birds migrating from the south and hear them chirping in a new language. 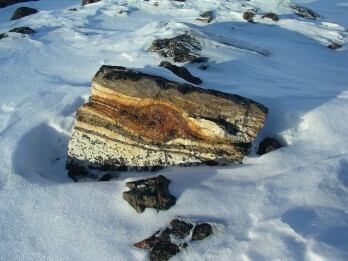 The rocks that are exposed to the sun heat up and make the snow melt. The vegetation below the snow cover has started to grow ... the arctic summer will be short, but intense. This is also the tourists' season. Visitors from a different countries come to visit us, three groups of five. We enjoy the visits and share our experience for the time of a cup of tea. The usual question is "... and you never get bored?". 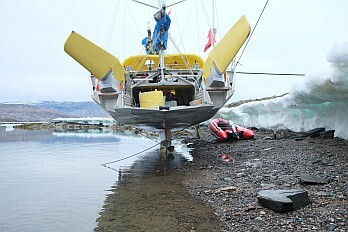 Preparations of our boat and the setup of the winter camp occupied most of the autumn. But since our camp is installed and everything is performing to our expectations, including the scientific work, we have spare time to follow our ideas, interests, dreams or being with others ... the Greenlanders say 'winter is a social time'. Our time is devoted to discoveries, developments, thoughts, ideas, projects, reading, writing, creating ... with the time it requires to accomplish each. It is also a time for discovering our natural environment, others and ourselves. We learn to let things happen. Without doubt, we never get bored. Enventually our visitor leave with the wish to come back. We have started to grow seeds. We rediscover the wonderful taste of fresh food. Of course it's symbolic, but it means a lot to us. Twilight now calculates sun, moon, twilight and solar flux, a way to celebrate daylight and the sun that make life on Earth possible and the moon that animates nature with its cycles. Cycles of nature are an important feature when living in the wild... follow this link. 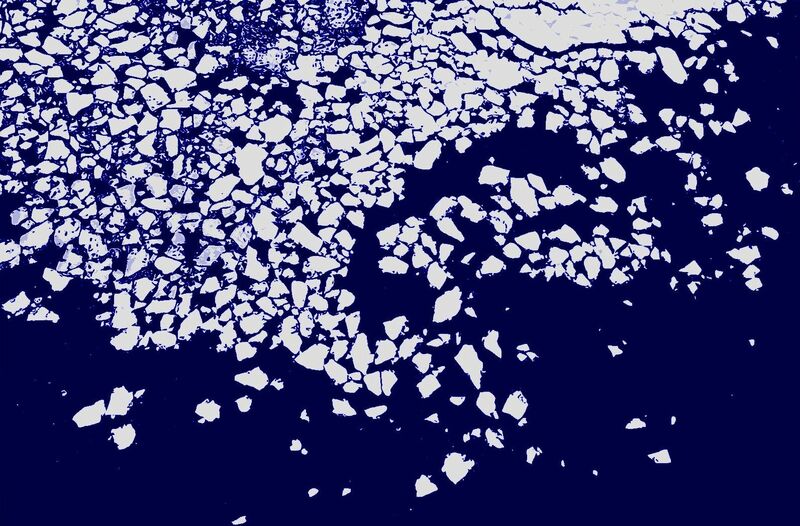 We ask ourselves: when will the ice let us leave? This will be our last big challenge. Land's end is how we call the western tip of 'our' island. There are strong tidal currents. 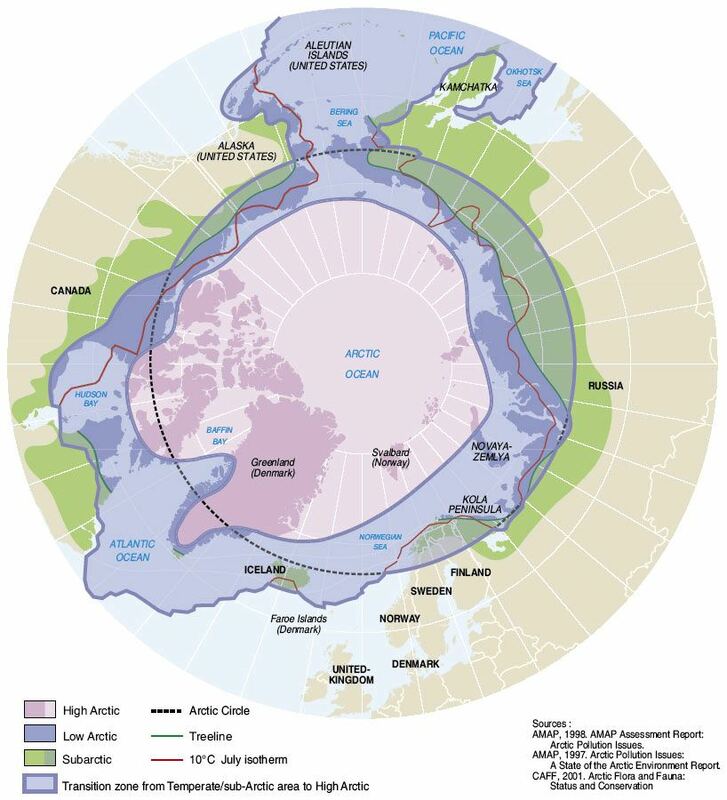 Whist water in the arctic is abundant, it is either seawater or frozen. So one needs to make some effort to get something to drink. And one drinks amazing amounts of water due to the loss through respiration of the extremely dry air. 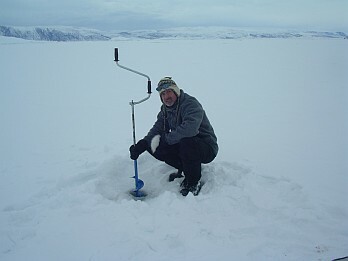 Liquid water can be found below the ice of the many frozen lakes, but requires to drill a hole, anexhausting job even with the help of an ice drill since ice is 1.8 metres thick by now. To collect the 70 litres of fresh water we use in a week takes two hours of time, including the 2 km walk to the lake, drilling the hole and filling up our jerrycanes. And this has to be done be it -0°C or -40°C. The comfort of a water tub is far away. But it is often difficult to apreciate things to their real value if you dont have to do an effort to get them. We apreciate our fresh water to its real value. 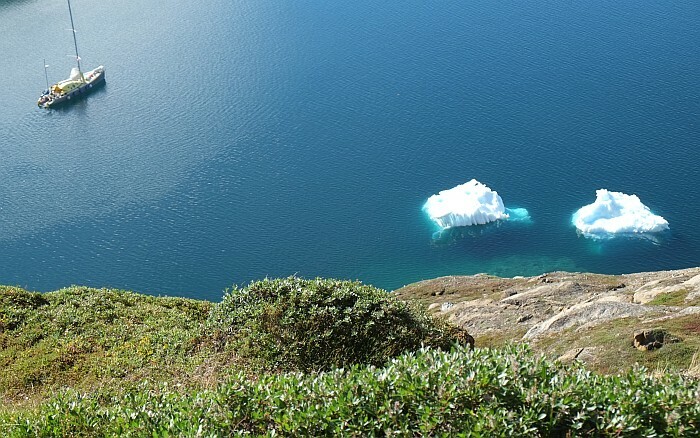 The locals melt ice from icebergs. The waters is the purest one can imagine. The ice is broken into chunks and made to melt in a plastic container inside the well heated dwellings. Water for washing com from the nearby lake. In the north one will find neither pressurized water nor evacuation. They will only be available in towns where reliable electricity is available. Failure of the electric heating will result in immediate freezing and damage to any water network. 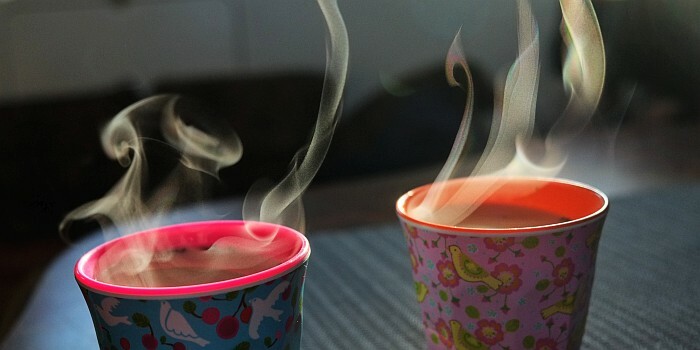 When observing the vapour above a hot cup of tea one will notice that time flows at a different pace. We live at the rythm of nature: sun, moon, seasons, the sky, life, ourselves. In two days time the sun will no longer set ... before August 21st. Things change progressively. This is one of the very specific features of this place on earth. Imaqa is likely to be the most used word in Greenland. Imaqa, specially when you plan to travel about. 'When will we leave?'. Often the answer will be imaqa: tomorrw, another day... The weather, the ice, the overwhelming nature make this imaqa necessary. Be it by dog sledge, boat or airplane, nature must be taken into acount, always. In the north our limits are clearly defined. Nobody would be stupid enough to transgress. Far from being a constraint, it brings us closer to essentials and lets us aprehend our real place on earth. That there is no distinction between man and environment. We are just a part of it. Life in nature is spectacular. Each day is different. Each moment is unique. Everything changes constantly. Including ourselves. This is life. Life is everywhere. One can feel it. We compose with nature, as good as possible. And a sailboat is ideal to get even closer to nature. 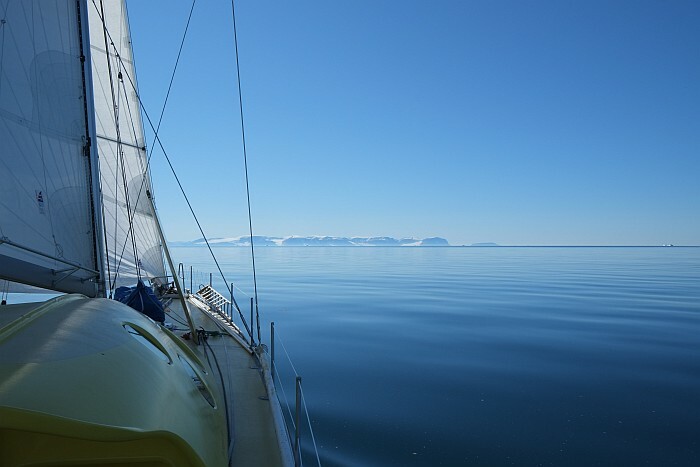 To make progress we need to listen to the whisper of nature, sense the slightest breeze, tide, current, ... Life on a boat is a great school towards simplicity, self reliance, responability, cohabitation, teamwork, friendship... rarely practiced in such a complete way elsewhere. For us it the beginning of an prenticeship, also a conquest. Thats already quite much. As by now, we are looking forward to our vessel to transform to more than an illu - igloo, the house : a boat. We imagine our return back to civilisation, inavoidable, due in time to lecture for the new academic year. Of course imaqa cannot be avoided. But since the years of sailing in moste remote places, we have always been able to honour our agenda. Good planning ist part of the story. But then it is mostly about making the best with conditions and letting a big place to welcome the unpredictable. We celebrate Easter. Its the springtime equinox. 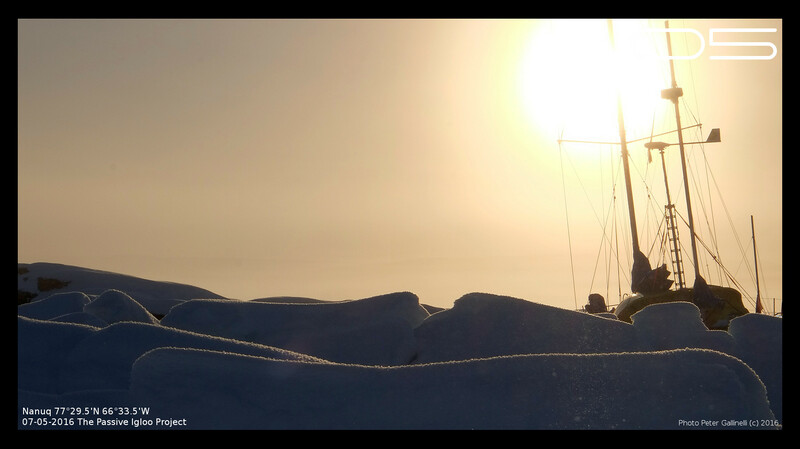 Sun has risen above the Pole and daylight reaches our location from the other side of the Earth, amplified by the bright ice and snow cover. We rediscover our environment under a new light. 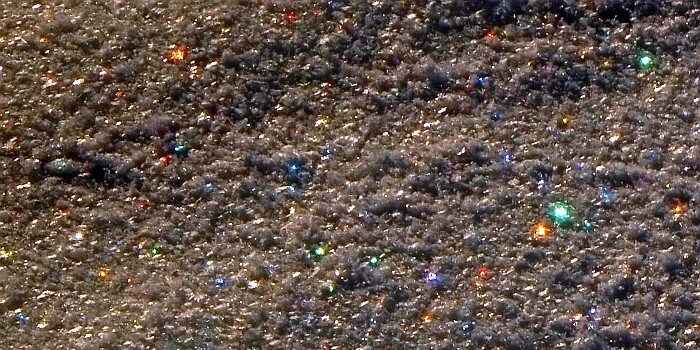 During the dark winter months our eyes had become used to the darkness. Now they have to re-adapt to bright sunlight, even whilst sleeping. Right now there is no more dark night. Beginning in a couple of weeks the sun will no longer set at all... The change is impressive. The light and clearness of the atmosphere give the impression that everything is within reach. We organize more and more excursions. 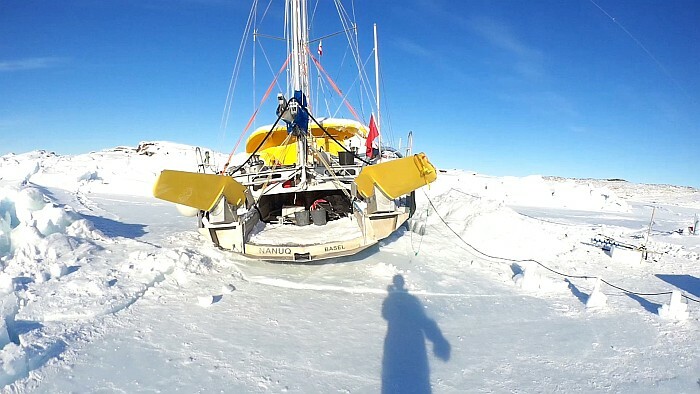 Temperatures are still far below zero, but we do no longer feel the cold due to our apprehension of lightness, sunshine, acclimatization and the perspective that the coldest periods are now past. Whilst the so called windchill factor gives indication to feeling of cold associated to wind, we have introduced our own sun-heat factor taking into account the effect of sun and calm conditions, a phenomena you will experience when sitting in the sunshine on a sheltered altitude terrace. By now, the windows that are exposed to the direct sunshine are warm and efficiently contribute to the cabin heating. We observe the first drops of melting water dripping down the warm hull - aluminum plates are perfect heat absorbers. In parallel, the scientific program goes on. 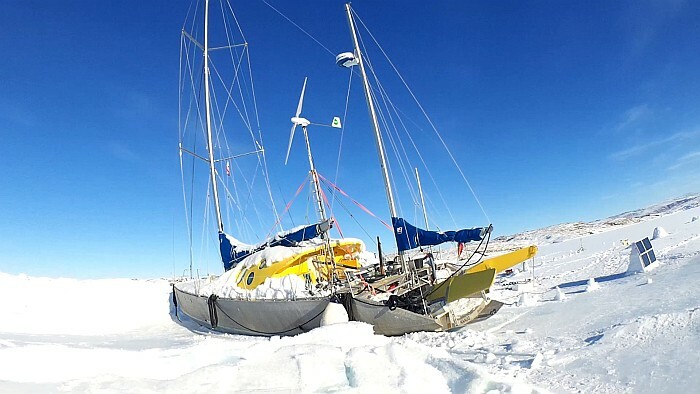 The monitoring equipments keep an eye on the passive igloo's performance, measure numerous climatic parameters, the sea ice and PCB concentrations ... while we set out to test breathing equipment for sports in extreme cold. It is gratifying when an experiment confirms an idea. And it is very instructive when they diverge. Knowledge of reality emerges when ideas meet experience.